An ethnic studies course covers learning about different cultures like Asian, Pacific Islanders, Latino, etc. 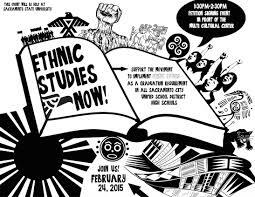 Ethnic studies is different from traditional history classes because in regular history classes students learn more about war, laws, our country, slavery, and white supremacy ethnic studies gives students a better understanding of what other cultures are made of or what they are about. Often times students hear stereotypes about a culture and think what they are hearing are facts. For example, people think Cinco de Mayo is Mexican Independence. If they took an ethnic studies class, they might learn that that Cinco de Mayo is a commemoration of a minor battle in Puebla, Mexico and that Mexican Independence Day is on September 16th. The purpose of going to school is to add on to what you’ve learned so far. So if you have already learned European history, it is time for you to learn about other cultures. How will students ever understand multicultural groups if no one teaches curriculum focusing on them? This is a social justice issue because many people do not know anything about Pacific Islander, Asian, African or Latino cultures and when a student’s own culture is the focus of a course, that student feels as if their culture is valued. Know that ethnic studies is a positive contribution for a student’s learning. According to the Dallas News, “Ethnic studies helps students to bridge differences that already exist in experiences and perspectives” (Ragland, 2017). However, understand that certain school districts do not think that way and tend to ban ethnic studies from their curriculum. According to a Stanford News article written by Brooke Donald, Arizona had a hard time accepting the fact that their students wanted an ethnic studies class added to their curriculum (Donald, 2016). And, according to an August 2015 Huffington Post article titled “Arizona Gets Schooled: Update on Ban of Mexican American Studies,” the state actually banned ethnic studies courses. Although, Arizona has looked down on ethnic studies, school districts in Oakland, California and San Francisco have added ethnic studies as a required course in high schools. One man who works for the Oakland Unified School District has been a full supporter of Ethnic Studies. Young Whan Choi, the ethnic studies coordinator for OUSD, discussed the benefits of Ethnic Studies during a February interview. He said marginalized groups do not have an ethnic studies experience, meaning they do not have the support or experience of learning different cultural backgrounds. In Choi’s opinion, the long term effects of ethnic studies would be an increased GPA, lower suspension rates, and self efficacy along with many more. Choi adds that he thinks people of color’s history is erased from textbooks, which does not give students the benefit of even learning as little as a inch of their ethnic background. The benefits of having ethnic studies is that students have the advantage of learning multicultural history all around. The experience of students of color without ethnic studies have low chance of knowledge of their ethnic background. Without them having the chance to learn it, they will be brainwashed that their history does not matter because it never got the chance to be taught to them. According to an article on the Stanford news titled “Stanford Study Suggest Academic Benefits to Ethnic Studies Courses,” author Brooke Donald talks about how taking an ethnic studies class can improve students’ academic performance. “A high school ethnic studies course examining the roles of race, nationality and culture on identity and experience boosted attendance and academic performance of students at risk of dropping out, a new study by scholars at Stanford Graduate School of Education (GSE) found” (Donald, 2016) “Not only made gains in attendance and grades, they also increased the number of course credits they earned to graduate” said Donald. This is important because ethnic studies increases GPA and improves attendance giving students the confidence and boost their self esteem. Ethnic Studies also bumps up student attendance, meaning students would more rather come to school because with their culture being taught at school students would feel more valued. If for no other reason than school funding purposes, school districts should adopt a class that raises attendance since funding is based on attendance. Ethnic Studies by Stasia is licensed under a Creative Commons Attribution-ShareAlike 4.0 International License.